Well, it has arrived. May. My nemesis. But this time I am prepared. Because it is the start of a new “thing“. This Month is Maintenance May. What is Maintenance May? Well, it is the obvious as well as a little further than that. This month I am going to continue what we started in April with Fit April, but also expand that to include the maintenance of all things in my life. Maintenance of my body, my brain, my soul, my stuff, my career, my training, my knowledge and my heart. Each day will be a challenge to do something to expand my thoughts and myself about myself and my world. To better connect with those around me and maybe grow a little in the process. Things I don’t normally do, things that make me anxious to think about. Not random kindnesses, but purposeful. Feel free to give a suggestion or two – I might need them. Emile will be following along as well, as he booked his Comptia A+ Networks exam for May 31st. He is going to maintain his career this month, and will participate somewhat as well. Today as I headed to my massage appointment, I drove up main street and by our Algonquin Theatre. Huh!? My eyes deceived me surely. I turned my car around and discovered what I saw was actually happening. 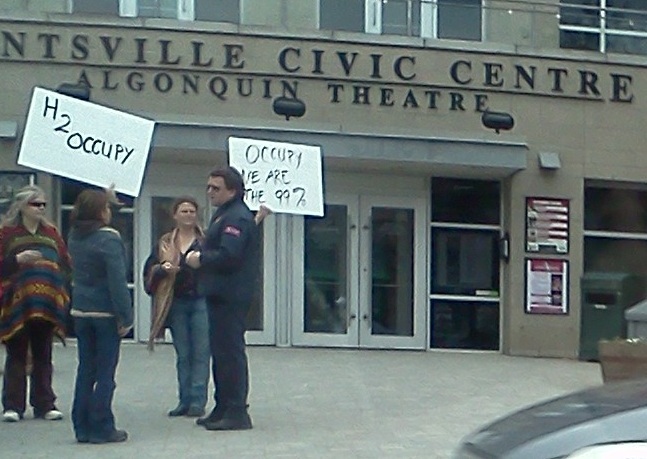 There really was an “Occupy Huntsville” protest happening. 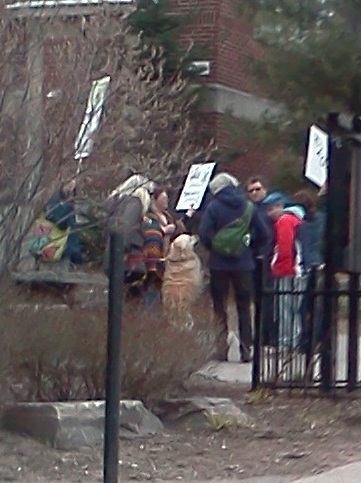 I’d heard this and that about a May Day “General Strike” in the US, but I hadn’t expected to see 6 or so protesters here in my 18,000 strong town. I felt the fool gawking at them, so I took terrible, surreptitious photos from my car down the street. May 1st, 2012 Extra-Ordinary: The inability to hide your face in this crowd. If you are going to protest in Huntsville, you are right out there. Proudly declaring your beliefs without the anonymity afforded in a large city. I am the 99% too, but I wasn’t out there letting people know.